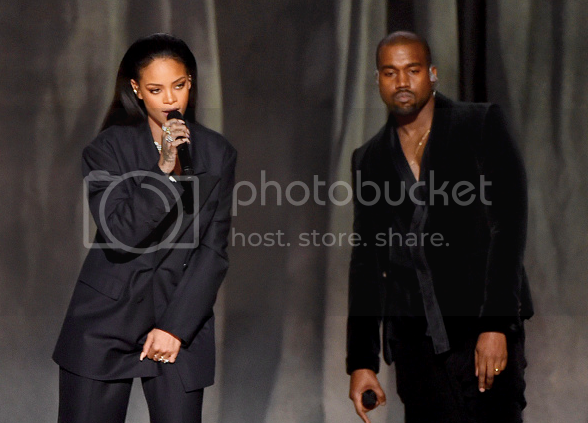 Rihanna Delivers Strong Vocal Performance in Television Debut of "FourFiveSeconds"
Home Grammys music performances Rihanna Rihanna Delivers Strong Vocal Performance in Television Debut of "FourFiveSeconds"
Rihanna is one of the biggest pop stars in the world, but she's never been a renowned vocalist. Her allure stems from something else--an explicable "it" factor. With each of her seven albums, she's given us something different and uncovers parts of herself. With her forthcoming project, it looks like the beauty will attempt to brand herself a "real" singer. The vocals for the first single, "FourFiveSeconds" are the best we've heard from her. She sounds strong and clear. Is she Whitney? Nope. But she's made major strides from where she began ten years ago. She debuted the song for television at the Grammys during a performance with Kanye West and Paul McCartney, and it was pretty good. Rihanna gets props for working to get better when she, honestly, didn't have to.